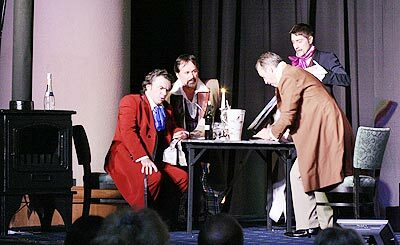 The Grande Ballroom of the Sheraton Grande Sukhumvit in Bangkok was the venue for the welcome return to Thailand of the European Chamber Opera, in a fine performance on November 3 of Giacomo Puccini’s La Bohème, arguably one of today’s most popular operas. For this performance, the cast who came to Pattaya last year with La Traviata were joined by the Siam Philharmonic Orchestra, conducted by Somtow Sucharitkul, the founder of the Bangkok Opera. The performance was directed by Stefan Sanchez, the artistic director of the European Chamber Opera. The world première of La Bohème took place in Turin on February 1, 1896 at the Teatro Regio, and tells the story of four poverty-stricken bohemians, a poet, Rodolfo, a painter, Marcello, a philosopher, Colline and a musician, Schaunard. The first act opens in their unheated garret; we see Rodolfo (Robert Millner) and Marcello (Stefan Sanchez) shivering with cold. The scene established the tone of the performance: a combination of beautiful singing and excellent acting. Colline (Dominic Barrand) and Schaunard (David MacDonald) arrive and they all agree to meet up later at the Café Momus. After Rodolfo’s friends have departed, he hears a gentle knock on his door – enter the seamstress Mimi (Anja Rossau), pale, cold and coughing – and their love story begins. The second act is set in the Café Momus, a Left-Bank haunt of artists and musicians. Musetta (Sandra Porter), formerly Marcello’s sweetheart, arrives with her rich and ageing admirer, and, as often happens in productions of La Bohème, stole the scene, lighting up the stage with her charisma, as she sang “Quando m’en vo,” a risque number about her attractiveness to men. Of course, she sings it to attract Marcello’s attention as she still cares for him! One of the most attractive elements of this performance was the joie de vivre of the four friends and their interaction with each other. During the ensemble that follows, Musetta distracts her ancient admirer, and when his back is turned she lies on the tables and Marcello (much to the delight of the audience) can’t restrain himself and ends up on top of her. The pace and feeling again changes in Act 3 as Mimi’s health is declining. She finds Marcello and tells him of her hard life with Rodolfo, and, hiding when Rodolfo arrives, hears him tell Marcello that he left Mimi because of her coquettishness, before confessing that he fears she is dying of consumption. The last act is set in the garret, with Marcello and Rodolfo bemoaning the loss of their respective loves. “O Mimì, tu più non torni” Schaunard and Colline arrive and the friends parody eating a plentiful banquet with only a small amount of food and sing and dance together. Musetta arrives, having found Mimi wandering the streets after leaving her wealthy patron, severely weakened by her illness. Haggard and pale, Mimi is assisted into a chair, and Musetta and Marcello leave the reunited lovers alone, in order to try to raise some money for a doctor. They recall their past happiness, and relive their first meeting. Musetta and Marcello return with a muff to warm Mimi’s hands, having summoned a doctor. Too late, as Mimi lapses into unconsciousness, and dies as Musetta prays. Rudolfo cries out his love’s name in anguish, and weeps helplessly. This was an incredible evening, with the soloists and the orchestra making the most of what must have been the perfect opera to showcase the entire company. La Bohème’s themes are as relevant today as they were in 1896, and the opera is perhaps even more famous and loved. The only downside to the evening was the relatively poor turnout; however, for all on and off-stage this was of little importance! As the European Chamber Opera continues their tour of south-east Asia, our neighbours in Chiang Rai can look forward to a performance of La Bohème at Le Méridien later this month. I personally will look forward once again to another night of opera by the company, next year in Bangkok. D&M Music Studio will present a piano recital by two talented musicians on December 16 at the AUA Language Centre on Ratchadamnoen Road in the old city, beginning at 7.30 p.m. The two young pianists, Na Nandhorn Boonruang and Ingvo Clauder will play both a selection of classical piano music including pieces by Bach, Schumann, Schubert and Berg, and a modern composition by Ingvo Clauder which includes electronics and is based on a Loy Krathong theme. Na Nandhorn Boonruang, born 1980 in Bangkok, began playing the piano at the age of 5 under the guidance of a 12-year Suzuki method and Norie Chinwanich. During this time, she took part in many concerts nationally and in Japan, as a soloist and a chamber musician. After gaining a BA in English at Chulalongkorn University, she decided to pursue a career in music and began her studies on 2001 at the famous Trinity College of Music in London under John Bingham. A scholarship from the Hanns Seidel Foundation took her to Stuttgart in 2003, where she studied at the Hochschule für Musik und Darstellende Kunst for 4 years with Florent Boffard and Nicolas Hodges. In 2006, she won 1st prize in the Bösendorfer Competition. Ingvo Clauder was born 1976 in Überlingen, Germany, and formed his musical language under the influence of Waldorf education and a 10-year classical piano study with Hans-Udo Kreuels in Feldkirch, Austria, where he obtained diplomas in piano in 1999 and 2003. From 2000-2002, he furthered his studies in London, gaining a B.Mus with first class honours at Trinity College of Music, studying with Anthony Green. During this time, he also won the Gladys Puttick Memorial Prize for extemporisation and the Mehroo and Byram Jeejeebhoy Prize for achievement in piano playing. Since 2004, he has taken a Master’s Degree course at the Hochschule für Musik und Darstellende Kunst in Stuttgart, specialising in contemporary piano music with Nicolas Hodges. He gained a diploma in composition of computer music at Künstlerische Ausbildung in 2008. Ingvo has dedicated himself primarily to free improvisation – with and without electronics – and jazz. He was invited to play with Aldo López-Gavilán at the Havana International Contemporary Music Festival 2004 in Cuba and with “pdconception” at Nattjazz 2005 in Bergen, Norway. In 2003, he co-founded a contemporary music platform (www.fonorum.com) with Lucas Dietrich. Tickets are priced at 300 baht (150 baht for students) and will be available at the door or by calling Khun Mongkol on 081-682-8000. The Gate Theater, Chiang Mai’s very own English language theater group, will close out the year with a comedy and a drama. The Jeff Goode comedy, “The Eight” Reindeer Monologues belies its title, and has been described as, “coarse, witty, vulgar and crude,” – definitely a play for adults only! It comprises a series of 8 monologues, one from each of Santa’s reindeer. Accusations, rumours and all-out attacks are flying fast and furious around Santa’s toyshop this holiday season. What’s the true story behind Rudolph’s unlikely rise to fame? Does Mrs. Claus have a serious drinking problem? Can St. Nick himself really be guilty of sexual harassment...against one of the reindeer? And with all this going on, how can the spirit of Christmas be saved? Go behind the tinsel and hear the truth about Santa straight from the eight reindeer who know him best. When a doe says “No,” she means “No Way, Sucka !” USA media reviews included the comments, “This gut-bustlingly funny – and completely outrageous – show, which is most definitely not for kids and should not be missed by adults, is shocking in a way theatre rarely is these days” (Boston Herald) and “delightfully perverse” (Chicago Reader). Directed by Stephan Turner, this is a definite “don’t miss,” which will take place at ArtSpace on 7, and opens on November 27, with performances through 30. Repeat performances will also be given in December on 21-24, and 26-28. All performances begin at 8 p.m., the bar opens at 7 p.m. Suggested donation is 250 baht. ArtSpace on 7 is located behind the Lotus Pand Suan Kaew Hotel, on Sirimongalajahn Road. For further information or reservations please call ArtSpace on 085-622-6607 or 084-041-7982, or check their website at [email protected] Reservations can also be made by writing to [email protected]. For its third and final production in 2008, The Gate Theater Group proudly presents Stephen Metcalfe’s beautifully told, timely story of love, loss, healing and hope, “Strange Snow.” Under the direction of Stephan Turner, Strange Snow features performances by Robert Young, Nathan Kieffer and Veronica Guarino. This performance is recommended for ages 15 and up. Strange snow falls on two young Vietnam veterans as they reunite for a fishing trip to make good on a long lost promise to an old friend. It’s dawn on Opening Day and Megs shows up at his buddy David’s house only to encounter David’s shy, plain sister Martha. Megs’ larger-than-life nature coaxes Martha out of her shell and into his heart. His mere presence, however, brings up painful memories of Vietnam for David, whose method of coping so far has been to drink too much and talk as little as possible. As a result of the play’s success and popularity, it was developed into the major motion picture Jackknife, with the screenplay also by Stephen Metcalfe, starring Robert De Niro, Kathy Baker and Ed Harris. “Strange Snow” opens December 5 and will run Fridays and Saturdays through December 20 at the Studio Theater, 7th floor, Central Kad Suan Kaew shopping mall. Doors open at 7 p.m. with curtain at 7.30 p.m. Suggested donation 300 baht. For reservations or more information write to [email protected] or call 087-177-2195 or +66866713371.